Structural strength Heavy gauge steel stampings with re-enforced ribs increase strength. Trouble-free maintenance The industrial-grade drive spring is protected from the environment. 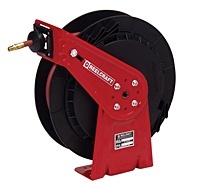 Hose retracts every time The latch mechanism is mounted on the guide arm to eliminate latch-out at full extension of hose. Long lasting latch spring A stainless steel torsion spring is used on the latch to insure maximum life. Long swivel life Our field-proven swivel assures long service life. Corrosion resistance Steel components are individually powder coated and teamed with composite materials, which virtually eliminates corrosion. Versatile mounting The guide arm can be adjusted to seven convenient locations. Lighter weight Composite spool and steel components make the reel strong yet lighter.